Getty ImagesOne expert says the worst mistake an investor can make is "sticking your head in the sand." Or in this case a paper bag. No investor is perfect, but hanging onto an imperfection a bit too long can add up to the point where it wrecks a portfolio, cuts a hole in your wallet or costs you a ton of money somewhere down the line. Here's the rub: How do you know you've made a mistake when you had no idea you were chasing your tail in the first place? Ignorance is one thing; smart investing requires a never-ending cycle of learning. But blissful ignorance is quite another. "The absolute worst money mistake is sticking your head in the sand," says Cary Guffey, a financial adviser with PNC Wealth Management. "Whatever the issue you are dealing with, the problem won't simply go away. The very first thing you have to do is confront and admit you have an issue. Until this happens, your situation will not improve." 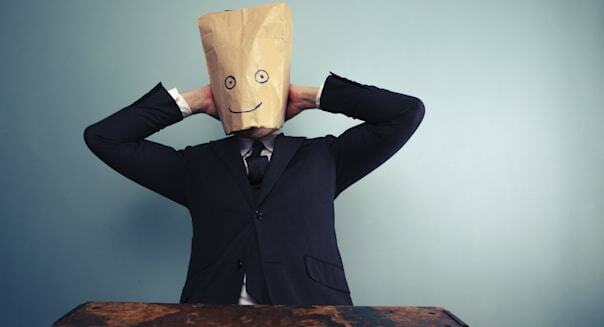 Here are 10 common gaffes investors make -- some emotional, some behavioral, but all avoidable. 1. Chasing a stock, no matter the price. It's too easy to get intoxicated by a growth industry or sizzling stock. "Ben Graham's famous quote [that] short term, the market is a voting machine but long term, a weighing machine, is still applicable," says Yale Bock, founder and president of YH&C Investments in Las Vegas and manager of two portfolios on Covestor, an online investment management platform. Highflying growth companies "are always part of the investment landscape, but the potential for severe capital losses increases if those companies fail to continue growing their revenues, cash flow and profits," he says. 2. Not keeping your emotions in check. Nothing hurts an investor quite like irrational feelings that override rational choices. "Don't let your emotions allow you to fall prey to gimmicks and trying to beat the market," says Scott Puritz, managing director of Rebalance IRA, an online retirement investment advisory. "Instead, opt for a simple, straightforward investing strategy. Likewise, investors who go it alone often feel anxious and ashamed by their lack of experience, and these emotions can cloud judgment." 3. Ignoring the contrarians. Contrarians aren't always right -- but when they establish a track record over the long run, they're worth listening to. "Often the best investment ideas are contrarian," says Daniel Beckerman, president of Beckerman Institutional in Oakhurst, New Jersey, and a portfolio manager on Covestor. "Sentiment was extremely low in early 2009 after the financial crisis when stocks hit their lows. In retrospect, this was the best entry point for stocks in recent years." 4. Misreading probabilities. Yes, it's "buy low, sell high" -- but sometimes what's perceived as high is really somewhere in the middle, if given enough time. "I constantly hear folks say that markets are at an all-time high, so we should get out of the stocks before they drop," says Benjamin Schwartz, a senior financial planning associate with Plancorp, headquartered in St. Louis. "While that may seem intuitive, statistically this logic does not hold up. Future returns are independent of past returns -- just as a coin toss does not determine how it will land based on previous flips." 5. Failing to ask the right questions. Too many people blindly hand their money over to financial firms and money managers, hoping for the best, says Bobby Monks, co-author of "Invested: How Wall Street Hijacks Your Money and How to Fight Back." These investors "dramatically increase their risk of ending up with lousy investments and overpaying for them. And it's not enough to simply ask questions. You need to understand the answers; for example, how they're compensated and whether they put a meaningful amount of their own money in the investments they sell you," Monks says. 6. Not periodically rebalancing your portfolio. Whether they're winning or losing, many investors are reluctant to sell, Guffey says. "The thinking goes that if something has made money in the past, it will continue in the future. The other side of the coin is when something is down, an investor starts telling themselves they will sell it when it gets back to a certain value," he says. Because rebalancing is an ongoing, systematic process, it takes the nonproductive guesswork out. 7. Counting on Uncle Sam for retirement. Some investors may put off retirement investing, thinking Social Security will make up the difference. "They should know that Social Security will only cover 10 to 30 percent of retirement living expenses," says Edward Kohlhepp, an independent financial adviser in Doylestown, Pennsylvania. People who don't hit on this at the right time "often start investing with too little, too late," Kohlhepp says. 8. Letting your bad behavior get in the way. Some investors might blame the market or rotten luck when they're responsible. "Ultimately it's our own behavior that does us in," says Peter Mallouk, author of "The 5 Mistakes Every Investor Makes and How to Avoid Them." "The key to dodging the pitfall is to be aware of what your instincts tell you and recognize behavioral land mines." These include overconfidence and succumbing to herding mentality. 9. Assuming retirement equals a lower tax bracket. Retirees ready to thumb their noses at the Internal Revenue Service might be in for a rude awakening, says Dave Henderson, a financial planner based in Greenwood Village, Colorado. "Many times when people get to retirement, they have paid off their mortgage, their kids are out on their own and they are no longer contributing to deductible retirement plans," he says. But between pension plans, withdrawals from retirement accounts and partial taxation of Social Security, "their income may not be much lower, and they have very few things to deduct, resulting in higher taxation than they planned for." 10. Assuming your adviser is a legal fiduciary. In investment, legal fiduciaries act solely in the investor's interests. And while only a small percentage of financial advisers have a legal fiduciary relationship with clients, "most investors believe their relationship includes a fiduciary duty," says George H. Walper Jr., president of Spectrem Group in Chicago. "This disconnect could lead to major conflict between the investor and the adviser if the reality does not match the expectation."